You are currently browsing the Airflow and Shade blog archives for April, 2013. Trees seem like they must be nature’s greatest gift when it comes to green building in the tropics, but when I compiled a list of the positives and negatives, there were actually more negatives, as shown below. However, in the bigger picture of trying to create a beautiful dream eco home, the positives still far outweigh the negatives. In general, beautiful jungle trees are for most people one of the principal attractions of the tropics, and many people fantasize about living in one, Tarzan style, when they first come to Costa Rica. But most will settle for living among them. From a green-building point of view, trees are a great boon for their shade, beauty, and as a sustainable construction material, but they can also be hazardous to your house, so I thought it was important to discuss this here so you can take precautions and be aware of the possible consequences of living among different types of trees. The most obvious benefit of a tree is its ability to shade your house, since by far the majority of heat energy affecting your home will be from direct sunlight. When it comes to shade, the best house site would have a large hardwood tree to the south, with branches overhanging it like a giant umbrella. Of course, we’re ignoring the dangers of the tree falling on your house, the problem of leaves raining down and clogging your gutters, etc (see below). The average position of the sun in Costa Rica is ten degrees to the south, and so a tree on the south side will be best placed to provide maximum coverage. The late afternoon sun is also very intense in Costa Rica, since your house will have been heating up all day, and then as the sun goes down, it will start to really affect the west side, so having a tree on the west would be the second best position, and because the sun will be at an angle, it won’t need to be overhanging. A large beautiful tree next to a house will make it so much more attractive as well as providing shade. A beautiful house with “curb appeal” is a better investment, and few people buying in Costa Rica imagine a house without any trees around. So whether it’s fruit trees, hardwood trees, or palm trees, almost any trees will make your home more beautiful and thus more valuable. Having a large tree next to your house is also a great way to see lots of wildlife, especially if that tree has its canopy connected to a larger forest nearby so that arboreal animals such as howler monkeys, tree opossums, sloths, or kinkajous can easily climb into your view without walking on the ground where they feel unsafe. Many house sites have a “view” side which faces the ocean or beautiful mountains, and the owners make the mistake of ignoring the backside. While an ocean view is fantastic, so it a view of a rainforest! This is where you’re going to see a lot of wildlife, and it’s often cooler on the jungle-side of your home. So, be aware that most homesites have more than one beautiful view. Wood is one of the greatest building materials, so consider planting a few, with the idea of harvesting them in the future. Your investment will take 25+ years to mature, since usually you can only use the dark heart-wood of the trees for building if you want to keep the bugs out of it without poison. But meanwhile, you’ve got shade and beauty. You may find it difficult to cut down a big beautiful tree you’ve become accustomed to seeing on your property, but you can cross that bridge when you get to it. All trees have roots, and some, such as the banyan/fig/higueron trees, have roots that are very invasive and penetrating. Almost any tree placed too close to your home will create a root structure that will damage your house’s foundation. Some green-building score calculators, such as the LEEDS system, give you points for keeping all vegetation a certain minimum distance away from the house. A way around this is to build the house on heavy concrete blocks/risers, so that any tree roots will simply grow around them, rather than trying to penetrate them. How close to the house is too close? The closer it is, the better shade it will provide and if it does fall, it’s not going to hit your house very hard if it’s right next to it. However, if it’s too close, then it can sway in the wind and break your roof during storms even if it doesn’t lose a branch. Most people seem to be afraid of snakes and some people are absolutely terrified of them, whether they’re venemous or not. I love snakes, and my current home is built right next to a large higueron “banyan” tree. Although I’ve never seen a snake in it, these types of trees are famous for being favorite places for snakes and other wildlife to hide in, because of their intricate and convoluted trunk and root systems provide dozens or hundreds of small crevices and caves for critters to hide in. A large banyan tree can be an eco-system of its own, and where there’s small critters, there’s the snakes who eat them. So, if you’re terrified of snakes, you probably don’t want one of these types of trees next to your house. 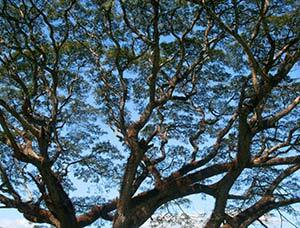 Certain types of trees are known for attracting termites. For example, the carao tree, a close relative of the carob tree, is a soft-wood tree that is often infested with termites, because the branches of it seem to have a lot of dead wood. So, if you have wood in your house’s structure, you probably don’t want to have trees such as this too close, because this termite food source will lead to more problems for you. Termites are nearly impossible to get out of your house through “organic” methods, so taking good steps initially is important. More on termites here. Leaves from your beautiful tree will rain down nearly day and night onto your roof and into your pool. If they pile up too much on your roof, then water can begin to leak between the tiles. If you have a gutter system, the leaves will undoubtedly find a way to clog it up, because even if you have extra-wide vertical gutter tubes, small sticks will also fall down and will assemble themselves into small nets that become dams that block the water. This leads to wood rot, leaking, and mosquito problems. Leaves will also fall into your swimming pool, where they will rot and require extra cleaning, and they’ll block your filter, which can burn out your pump, costing you $400 or so every time it happens. If you want a tree overhanging your house, you should design it so it doesn’t have gutters, and the roof should be fairly steep. Water and leaves will run off, and you’ll control the water on the ground with gravel or other techniques so it runs where you want it to go. For your pool…. keep it away from trees and check it often when it’s windy. Lots of leaves will blow into your pool, clogging it up within an hour sometimes. Some people are in for a shock when they purchase a home that’s in the shade during rainy season, only to discover that when you need it the most, in dry season, that shade tree loses all its leaves! This is often the case in beach houses such as in Santa Teresa, where there are a lot of pochote trees. Trees keep from having their leaves burned by the sun by constantly evaporating water to keep them cool. Once their root systems have sucked out all of the available water, many trees in Costa Rica will go into dry-season hibernation. Trees that have leaves all year usually have deeper root systems that reach more water. You can help this by watering your trees roots, so it will hold onto its leaves longer. You can also plant trees that have leaves all year, such as palm trees, beach almond, mountain almond, and higueron/fig/banyan trees. Most local hardwoods lose their leaves for at least half of dry season, and almost all softwood trees have shallower root system and thus are the first to drop their foliage. In drier parts of Costa Rica, the entire jungle appears to turn into a huge pile of kindling, and it seems almost a miracle that there aren’t more forest fires here. I really wouldn’t recommend having trees overhanging your house if they’re connected to the jungle and are the type that tend to lose their leaves. If you do, you should have a chainsaw ready and plan to run out and cut down that tree in the unlikely even of a forest fire, or else it’s going to destroy your house. One of the best parts about tropical living is being able to have fruit trees around your house so you can get them for free and super fresh. Most are seasonal, but a few, such as coconuts, bananas, and plantains, produce food for you all year. Some types, such as mangoes and water apples (manzana de agua) can produce so much fruit that you can’t possibly eat it all, and it can become a nuisance, with hundreds of fruits rotting on the ground and creating lots of flies. Palms don’t need a lot of water, and the best type of palm is the coconut palm, because they give you coconuts. Coconut water is one of the healthiest things you can ever drink. The negative side of coconuts, besides them falling on your head or breaking your car’s windshield, is that if you leave them around during the rainy season, they will collect water and make perfect little breeding pools for mosquitoes. So, you should chop them up with a machete and let the husks compost. Possibly the best type of soft wood tree is the Ylang Ylang, which has the most beautiful fragrant smell from its yellow/green flowers around dusk. It also has green berries that are a favorite of toucans, kinkajous, and other exotic birds and animals. If you have them on your property, wild animals will discover them and use them as a feeder, since the Ylang Ylang tree has its berries all year in both rainy and dry seasons. So, I highly recommend you plant a few of them on your property, preferably close enough to the jungle so that animals can reach them without climbing onto the ground. Many ylang ylangs will also keep their leaves all through the dry season if you give them water. However, they’re not much good for shade, because they’re shaped like a Christmas-tree. Hardwood grow slowly but are what we need to rebuild the jungle. Most of the hardwood species have already been cut down for lumber, and it will take around 200+ years to build back up to a real primary forest, which is mostly full of mature hardwood trees. Since it takes so long, start planting now! I have titled this website “Airflow and Shade” because I personally consider them to be the two most important factors for tropical green building. It seems obvious that you’d like to have a nice breeze flowing through your home, but so many people, including most architects, build houses that don’t allow for an appreciable amount of fresh air, so I thought it was important to revisit the obvious so that when you’re planning your home, you can build it right, and insist that your architect focus on this aspect. Great airflow isn’t about machines or purchasing any special equipment. It’s just about correct design. Trying to find the right balance of privacy, both visually and acoustically, can be challenging. You can create artificial airflow by using ceiling fans or standing fans, which you will probably have in most rooms in a tropical house, and are much more energy efficient than air conditioning. But that’s not what we’re talking about. 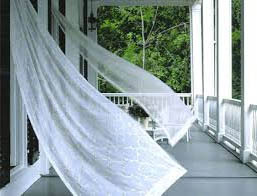 What we want is natural, free air flow that comes from the design itself by taking advantage of ambient wind. The first step in this is also the first step in permaculture: “prolonged observation.” You should understand in which direction the air naturally flows, and during what time of day? For example, in the afternoon when it’s hottest, is there a usual direction of airflow that you can take advantage of? From which side do storms tend to blow? Where is the sun during dry season when it’s the hottest? The most important thing is to understand where the breeze is usually coming from during the hottest part of the day. Then, you can simply orient your house so that you have windows on both sides that can be opened to allow air through. Now, consider what type of air is going to be passing through. Is that air going to be heated on a dark-tiled patio? Or, will it possibly be blowing first over a swimming pool or fishpond? Any pool of water will have constant evaporation, which is an endothermic reaction, meaning that it absorbs heat. So, a pool can help keep the whole house cool. 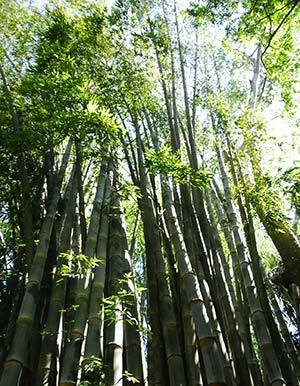 Plants, especially bamboo, constantly absorb water and evaporate it through their leaves. They do this in order to keep from burning up in the hot sun, and this is also why so many trees on the Pacific side of Costa Rica lose their leaves in the dry season… they must go into hibernation once they’ve used up all the water their roots can find. You can take advantage of this by planting small bamboo or other plant with a high evaporation rate on the wind side of your house. Of course, planting too much will create a wall that blocks the wind, so you have to get the balance right. An ideal situation is to plant a hillside with bamboo that the wind sweeps over before hitting your house. A design like this can help make your home seem magically cool and save you a lot of money in electric bills. When most people build a house, including most architects, they don’t think so much about how the air is going to flow through the house. The simple way of course is to put in lots of windows. One option that’s used frequently here in Montezuma is to simply make many windows with folding wood shutters that open while you’re in the house, and closed when you leave. They are locked with a long piece of wood or metal latches. This type is inexpensive and fairly secure, but not ideal for buggy or stormy days, since when they’re open, they’re just large holes and anything can fly in, from mosquitos to rain. Another option is aluminum windows, which is what I always use when designing eco-houses. You can purchase a type with three or four tracks, so you can have both glass and screens. The screens seem to block about 70% of the wind, but keep out most bugs. If you have them, it becomes part of your lifestyle to try to remember to close them before dusk, so the bugs that come out around sunset aren’t flying into your house, attracted by your lights inside. You can add all the windows you want to a house, but if the design isn’t right, they can only help so much. For example, if the house is bisected by a hallway or design features that include internal walls, then air can only blow into individual rooms, but not through it. Of course, more efficient cooling is obtained if air can easily flow all the way through the house. Since heat rises, you can improve cooling efficiency by having clerestory windows around the top of the house. This is great for adding natural light too. So imagine that you take a normal house, and raise the roof half a meter up, and between the walls and the roof, you add open bars with screening. Then air can flow through the entire house, blowing out hot air that would normally be trapped in the rooms. While this is a great trick, the disadvantages are that you will have no sound privacy anywhere, and also you can’t air condition any rooms like this. More about this here: clerestory windows. It should go without saying that picking the right location for your house is crucial when it comes to airflow. Homes that are located within dense jungle may get a lot of shade, but they will overall be hotter because of the extra humidity and the lack of air flow. In the world of tropical greenbuilding, bamboo is one of the most exciting and popular materials for many reasons, such as it’s strength, it’s beauty, and the fact that its a renewable resource. The types of bamboo that you may find growing on your property in Costa Rica is probably not going to be the strongest type. There are many varieties that grow here, depending on the area you live in. For example, in Montezuma and Santa Teresa, we typically see both a yellow and green variety. The yellow one is aggressive and invasive, rapidly spreading to take over a space where it’s planted. The green on is a “clumping” bamboo that spreads out more slowly from where it starts. The green one is stronger, but neither is really ideal for building a serious structure like a house. For that, you’ll want to probably use Gadua bamboo, which is originally from the mountains in Colombia, and is the strongest variety around. You may have heard that bamboo is one of the world’s fastest growing plants, so you may imagine that you can plant it and then in a few months you’ll be harvesting all the bamboo you need. Unfortunately, while individual stalks of bamboo can grow very quickly, it takes a while to establish itself. We say “The first year it sleeps. The second year it creeps, and the third year it leaps!” So basically it’s not going to do much until the third year, when you’ll see a tall stalk or two. But you can’t cut it or you won’t have any more… you need many more years before your bamboo patch is really large enough so you can take enough to build something substantial and not decimate your bamboo crop. So, if you’re serious about bamboo, start planting now, in multiple locations, preferably with lots of sunshine and water. Along a river or quebrada is a good place. You can dig up the “hijos” (children) of bamboo and plant them like you would bananas. Or, you can cut a stalk of bamboo and if you plant it immediately, laying horizontally just under the surface, each joint will sprout a new baby. This is a great way to plant a fenceline of bamboo. Is bamboo stronger than steel? Fans of bamboo like to say this, and indeed, it’s true for some types of bamboo under certain types of tests. The “strength” of a material can be measured in many ways. Bamboo is very flexible, making it great for earthquakes, and an application like scaffolding. In fact, I’ve personally seen bamboo scaffolding, held together with zip ties, going up 60 floors in Hong Kong! However, it has its weaknesses too. If not treated correctly, bugs and fungus get into it quickly. Also, rain and sun break it down very quickly, and so it’s not a suitable material for long-term outside applications. But, it’s great under a roof. Even the strongest bamboo will be quickly infested and eaten by termites and other bugs if it isn’t treated. There are several different treatments used in Costa Rica, but the most common, and clever method is probably to put a large tank of water, with a solution of borax (which is no more toxic than table salt) on top of a hill, with some food coloring in it. Some also add copper sulfate to the mix. The bamboo is cut and within a few hours, while it’s still partially alive, a tube is attached to the bamboo using a correctly sized rubber gasket and a pipe clamp. The solution, if it’s sufficiently high above the bamboo (around 100 feet / 30 meters) will absorb all through the bamboo. The food coloring will allow you to see that the solution has penetrated all of it at the end, and to know when to turn of the pressure. This treatment will permanently protect the bamboo from insects, but that doesn’t mean you can put it out in the rain and sun. Bamboo is thus inappropriate for fences, which would seem a natural use. If treated, you can use it outside and it will last a few years, but it will weather quickly. Many people who try to work with bamboo are surprised to discover that bamboo isn’t exactly hollow. It’s only hollow between the joints. So, if you have a clever idea for an invention that uses bamboo as a piping material, now you won’t be surprised when water doesn’t flow through it. If you want to use it like that, you’ll need a special drill that can bore a large hole through the joints. So where do you use it? The simple answer is that it’s best anywhere where it won’t get wet. It’s great for building a structure underneath a waterproof roof. Other uses: internal walls, lining a ceiling, furniture, rafters support structures. And of course it can be cut and carved into all types of household implements such as plates, bowl, spoons, etc. You can buy a “bamboo splitter” which is basically a cylindrical ring with two handles one or more blades inside. Imagine a Mercedes-Benz symbol where the inside is three blades, and then add two handles outside. Using a mallet, you force the bamboo rod through the ring, which will split it into three equal parts. Splitters are made for splitting into two, three, four, and more equal pieces, each type of size has a different use in construction. Do I use nails or screws with bamboo? Most use neither. The preferred way to build with bamboo is with wooden pegs. Usually an extremely hard and durable type of local hardwood is used. Bamboo is strong, but fairly soft when you saw or drill it, so it’s fairly easy to cut a hole through it and put in a peg to join two pieces of bamboo together. Some builders also add hose-clamps to the ends of the bamboo, especially if they notice a fine split forming, to insure it’s strength. Building with bamboo is a special art, but it’s fairly easy to learn from YouTube videos. Or you can take a class to gain more practical experience with the finer details.